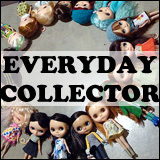 BlytheLife.com » Interview with Monika of Orchid’s Designs & Giveaway! As March draws to a close, so does the 2014 March Talent Showcase! To round out this year’s lovely entrants is Monika of Orchid’s Designs– who sews, designs and created a fashion sketchbook! Are you as curious as I was? Continue reading! Hi Monika! What can you tell us about yourself? 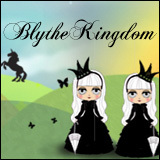 I find that everyone discovers Blythe a little different, how did you discover Blythe? The first dolls I discovered were precious artist-made porcelain BJD. Through Flickr and doll-forums it was inevitable I found out about Blythe, but didn’t get my first till mid-way through last year – Prima Dolly Violet SBL. My good friend Karolin Felix customized her for me, and the obsession with Blythe was truly begun. 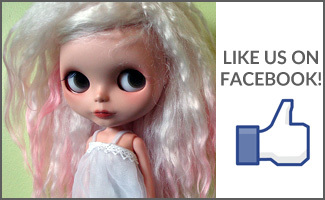 What was the first thing you created for your Blythe dolls? 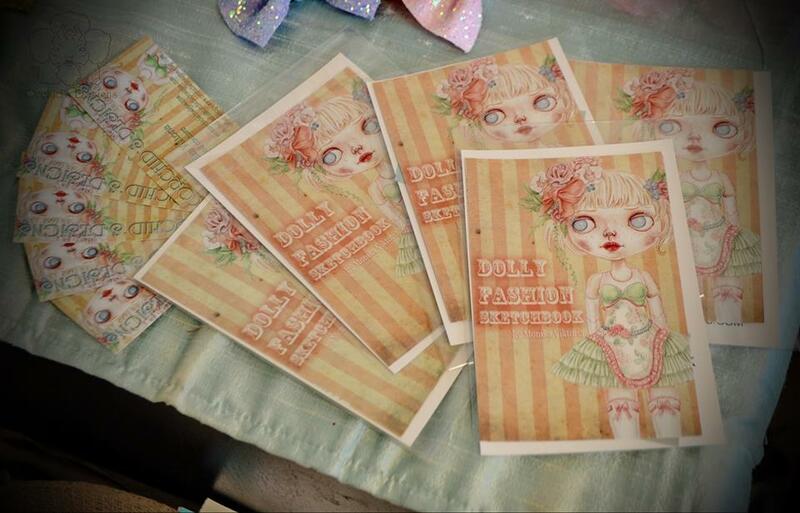 Almost immediately after falling for Blythe I began designing the Dolly Fashion Sketchbook. Frustrated with my designs being scattered throughout different sketchbooks and notepads, I wanted to create a beautiful and useful fashion sketchbook just for Blythe. Each page has a big-eyed cutie template, room to plan custom eye-chips, jot down notes and inspirations, and glue in fabric swatches. Perfect for customizers and seamstresses, the Dolly Fashion Sketchbook is ideal for all fans of Blythe, to plan her next fabulous outfit! How has your background in Fine Art and Illustration been able to help you with your business? How has it hindered you? My background as an illustrator helped me when designing The Dolly Fashion Sketchbook, wanting to create a beautiful tool for people less confidant with their drawing skills. The entire book is fully hand-drawn, including the design elements and templates inside. Also, having a romantic painting style of my own applies when customizing my own dolls, they are the three dimensional embodiments of the nymphs and coquettes I have been illustrating for years. What was the first project that you sewed for Blythe? What did you learn from that experience? The first Orchid’s Designs creation I sewed for Blythe were a series of vintage-style attic dresses of silk and gossammer organza. I usually make my designs “skin tight” so had to be careful when working out the patterns to fit both the Takara and Pure Neemo bodies. 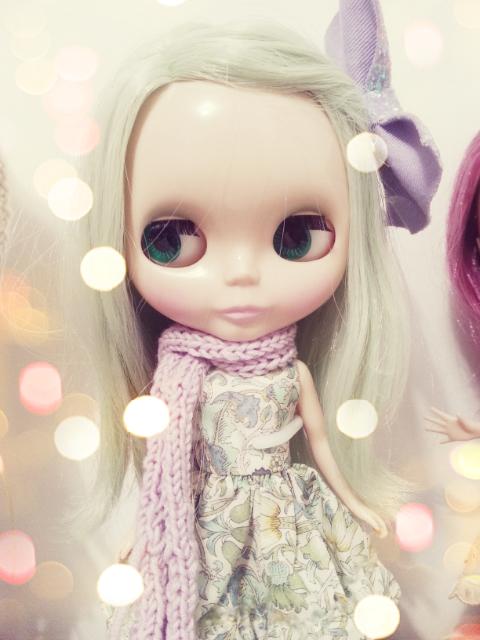 What would you consider to be your most elaborate outfit for Blythe? How about your most favourite? Or least favourite? 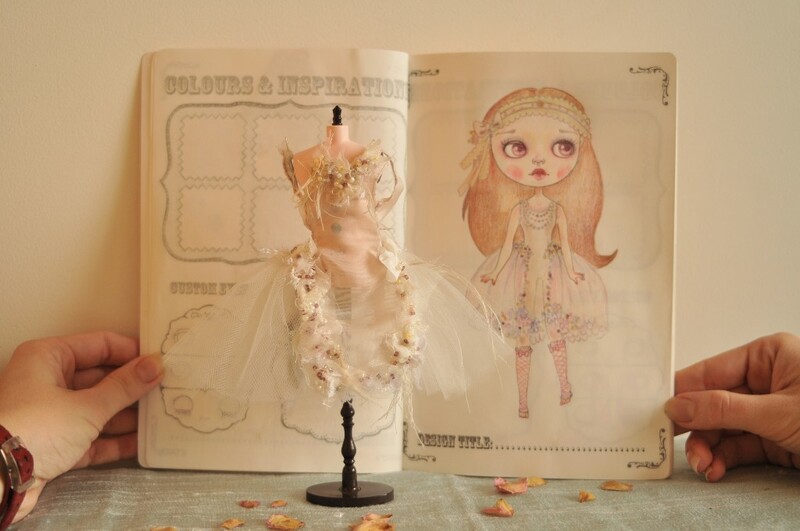 My current favourite design for Blythe is my “Ghost Fairy” dress, inspired by antique elaborate ballerina costumes for theatres – puffs of shredded tulle and lace tatters, delicate beading glimpsing at the neckline and along the hem. Citrine – my first custom Blythe wears an extravagant 6-piece OOAK costume including a brocade corset, lace leotard and fully beaded sequin helmet. At my first Blythe-con in Glasgow, UK, I was awarded first place in costume design for my pink tartan ensemble, a great honour and recognition for me. How has designing for Blythe changed the way you interact with people in the community? Blythe has found me many good friends, and allowed me to reach a great audience. I’ve met wonderful and creative people at BlytheCon, on Flickr and Facebook. I really enjoy participating in group challenges, competitions, and doing creative trades with other talented artists, customizers and designers. It would be wonderful to work on a communal project, I have seen some incredible collaborations!! What can you tell us about what we can expect from you and Orchid’s Designs in the future? 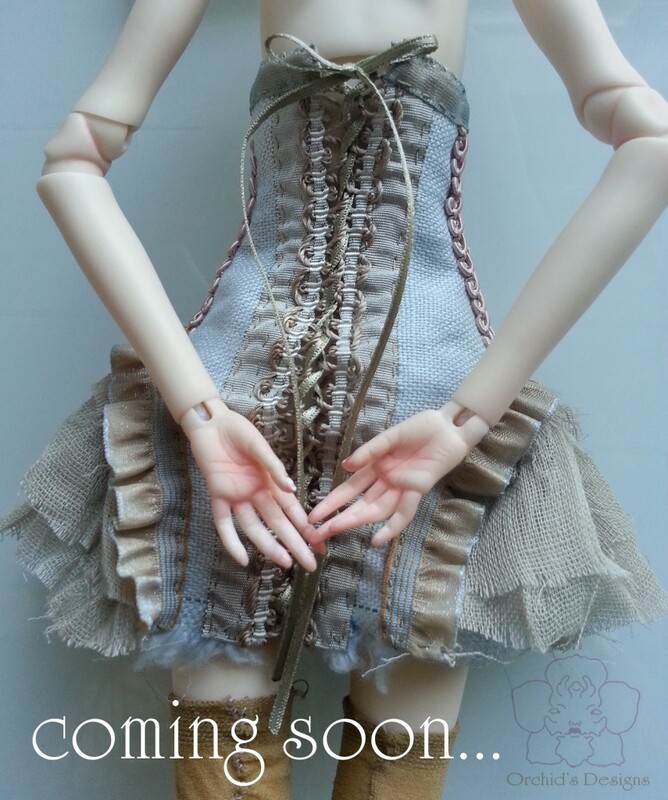 Orchid’s Designs will continue to create exclusive and OOAK haute couture for rare artist BJD. For Blythe we will be offering unique pre-order commission slots for limited edition designs, and beautiful customised Neo and Middie Blythes with a unique and artistic twist, elaborately costumed visions reflecting my paintings. All my future custom Blythe’s will hopefully be unique creatures completely different from other dolls. 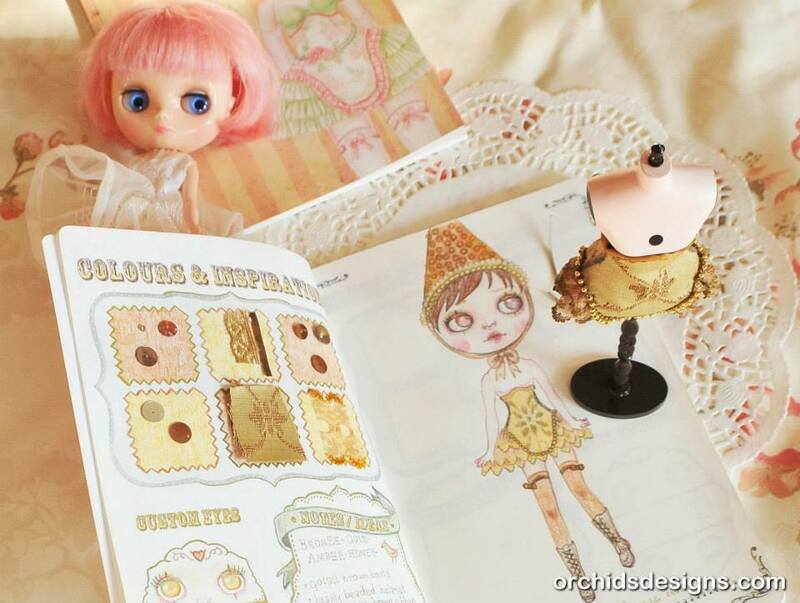 What do you find different about sewing for Blythe in comparison to other dolls and body types? Blythe with her odd proportions demands her own style. My elegant designs for long-limbed BJD do not translate well, she suits cute and quirky styles, and can pull of silly designs that might appear twee on other dolls yet still look endearing on Blythe! What would you say is the most important tool that you use for your design work? A good imagination!! I draw many designs and ideas in my Dolly Fashion Sketchbook, filtering it down so that only my favourite ideas make it to realisation. Then I spend a lot of time lovingly creating a precious finished object, making sure everything is one-of-a-kind. My materials are sourced from around the world and carefully selected to ensure the highest quality and individuality. Thanks for doing this interview with me, Monika! What advice do you have for someone who’s interested in designing for Blythe? It’s been my pleasure!! My greatest advice would be to always stay original and true to your own personal style – there are so many talented artists involved with Blythe doing their own thing, don’t fall into the trap of wanting to copy their designs, styles or trends. Creating something fresh and new will be far more rewarding than re-creating something by someone else. Also – do it for the love of Blythe! To learn more about Monika, check out her website, blog, Facebook page, Flickr photostream and Etsy shop. Monika has generous decided to giveaway five gift packages from Orchid’s Designs. Each gift pack will consist of postcards, sample pages from her Dolly Fashion Sketchbook and a knitted scarf, like in the photos above! The giveaway runs until Saturday April 5th 2014 at 11:59pm Pacific. The draw will be held on Sunday April 6th 2014 and the winners will be announced on BlytheLife.com. Remember to use a valid email address for all comments. If you win, your email will be forwarded to Monika so she can get in contact with you regarding sending you the prize. I found Monika’s article very interesting. 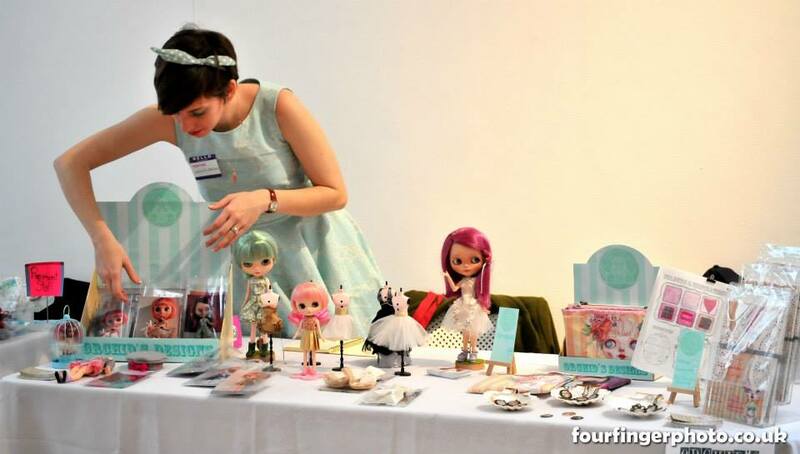 She is very talented and I like how individual her items are…not the run of the mill Blythe stuff often found. All of her designs are really pretty ! Thanks for the article and the giveaway. Great designs! Love Monika’s style. Thanks for the chance. Hi Monika, I don’t have a Blythe doll yet I hope to someday. I love your Imagination. It’s just like Blythe is your little fashion model. 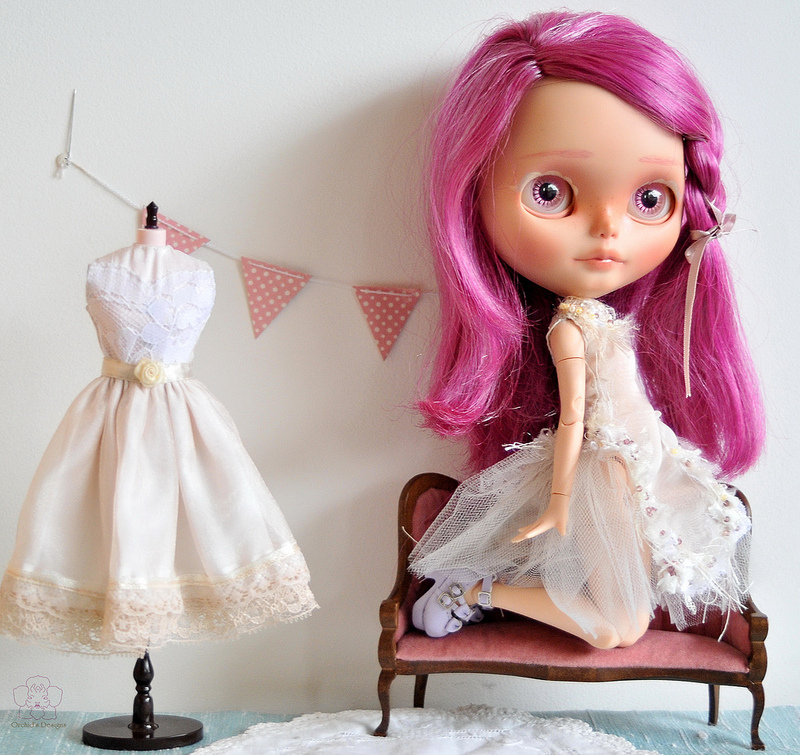 Once again I find myself longing for a Blythe doll, sometimes I dream about having one. I have a weakness for that little cutie. Much luck to all! Great to read the interview! The sketchbook is a treasure trove! Thank you, too, for this contest!